A minor derailment has blocked the main rail line between Seattle and Portland. Burlington Northern Santa Fe spokesman Gus Melonas says Amtrak and Sound Transit commuter train passengers are taking buses while some freight trains can be rerouted through the Columbia River Gorge. Two cars of a Union Pacific freight derailed as the train was switching to Burlington Northern Track just south of Seattle, near Boeing Field. The two cars carrying general freight remained upright and there was no hazardous material spill. 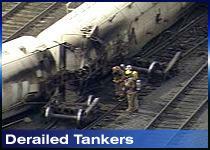 Cause of the derailment is still under investigation. Repair crews worked overnight to reopen the second of two Burlington Northern Santa Fe rail lines that were closed by a derailment in which some flammable liquid was spilled. Three cars tipped onto their sides and three others remained upright after jumping the tracks about 3:20 PM Monday, blocking both main lines between Seattle and Portland, Ore., railroad spokesman Gus Melonas said. The cause of the derailment was under investigation.